Categories: Blue Leis, Fragrant Leis, Fresh Wedding Leis, Graduation Leis, Green Leis, Hawaiian Leis and Corsages, Lavender Leis, Men's Leis, Red Leis, Vine and Leaf Leis, White Leis, Yellow Leis. Although like any Hawaiian lei, a ti leaf lei is appropriate for any and all occassions, ti leaves are traditionally thought to bring good luck. 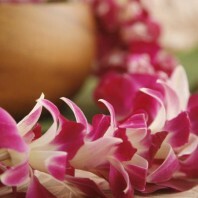 This lei is a thoughtful way to send off a loved one going on a journey or beginning a new career or other life change. These are some of the best graduation leis for men. 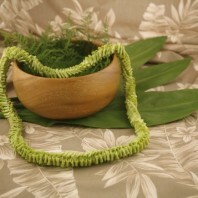 Green ti leaves are braided together to create this special Hawaiian lei. 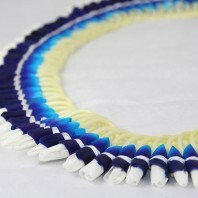 This is a light, easy to wear closed lei. The leaves are a very dark green. 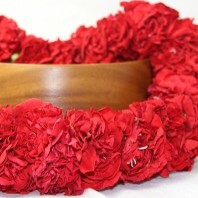 Available as a single thickness lei or double the thickness for double the luck! 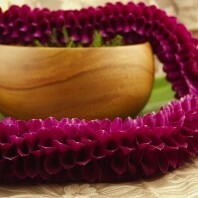 For some color we can add a few orchid blossoms to the single lei. Select your color in white, lavender, or purple. We can also do a mix of the three colors. Ti leaves are frozen or microwaved to make them supple enough for braiding. 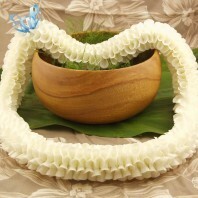 The stem is removed and the darkened, soft leaves are braided into this lovely lei. This is also know as ‘hili’ style meaning braided. 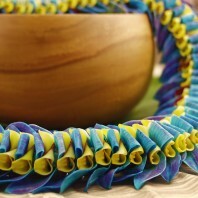 Maile style ti leaf leis are made in an open style. They are usually worn by men. This lei drapes around the neck and hangs to the waist. It is often worn by the groom at a Hawaiian wedding. 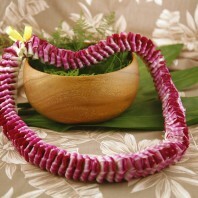 We can add color to a maile style ti leaf lei with an orchid strand. This is a single strand of dendrobium orchids. It extends just short of the ends of the ti leaf. Colors are white, lavender, purple or a mix of all three. The color provides nice contrast to the deep green leaves. 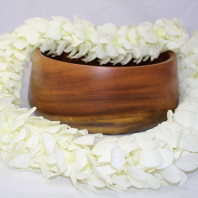 We also make this Hawaiian lei with fragrant tuberose flowers. 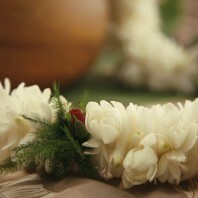 Adding tuberose makes the entire lei a sensitive lei. You must read our Terms and Conditions prior to ordering. Sensitive leis are not guaranteed for shipping that requires 2 days. 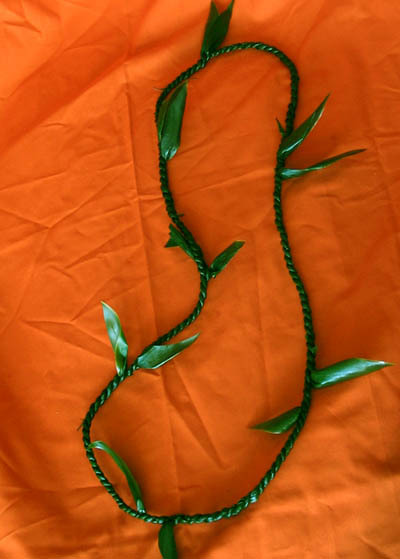 A maile style ti leaf lei is an alternative to the more expensive maile vine lei. 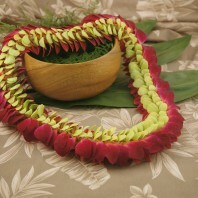 For the longest life and freshest appearance of your lei, unpack fresh ti leaf lei immediately upon arrival. Place in the fridge until use. No need to mist the ti leaves. If there is an orchid strand included the orchids can be carefully misted with clean lukewarm water. Ti leaf leis can be frozen for use later, but should be thawed out entirely and drained before use. Do not freeze leis with orchids. Ti leaf leis will last for about 5 days from the date they are made and shipped. Hawaii has long been known for its ti leaves. The leaves are part of native, flowering plants that have been used by Polynesians for years. In ancient times, the plant was used to make clothing, medicine, shelters, leis, liquor and sleds. It also played a role in island spirituality and royal politics. In modern times, it has been used to create floral arrangements and gift baskets. Many landscapers like to use the ti leaves as well. And it should be noted that in olden times, people planted them around their homes. Only then, the plants were seen as a form of home security rather than part of decorative borders. The homeowners were worried about evil spirits attacking their homes and they believed that the plants would keep the ghosts at bay as well as bring their families luck. Considered part of the Cordyline genus, there are many types of ti leaves that are used today. The various cultivars are generally separated into color groups. Among the most popular are green, purple, red and orange. However, there are a multitude of hues and hybrid color creations to choose from as well. So it is beneficial to look at all of the different ti leave combinations before choosing an assortment for floral arrangements. In order for ti leaves to look their best, the plants must be grown in ideal conditions. In general, that means choosing partially shaded areas with excellent drainage and room to grow. After all, healthy cultivars are known to stretch out a good 5 feet wide and grow upwards of 10 feet tall. Also, the ti leaves must be closely monitored for signs of disease, sun damage and insect activity. With that said, they are especially prone to ring spot, aphids and other leaf hoppers. They generally cause discoloration and wilting, which makes the leaves unacceptable for use in floral arrangements, gift baskets and cooking applications. To learn more about ti leaves and how beautiful they can look when added to arrangements, please see our Hawaiian flower assortments. 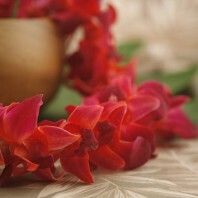 We have several fresh Hawaiian flower arrangements available that include healthy ti leaves and tropical blooms. We also provide ti leaves for decorating, cooking and hula skirts. 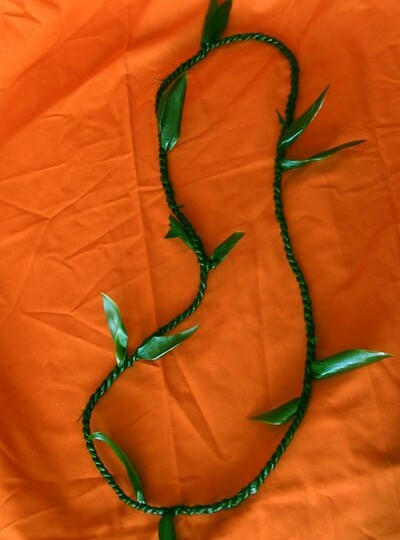 You can make your own ti leaf lei with our Hawaiian ti leaves.